Owning show horses is very different from my early childhood experience with the cow horses my father owned. So a four years ago when my trainer suggested my horse would benefit from having some chiropractic work done, I thought she was crazy....... My trainer convinced me to try Dan Marcum, and the difference after Dan worked on my horse was extremely evident. My horse was back to being willing to work, bend easily, and the lope greatly improved. I now have Dan come every 6 weeks to work on my horse. I am a BELIEVER! In October 2011, I observed the Equine Flexion Therapy Certification class, taught by Dan Marcum. I was very interested in what Dan was doing, and decided to attend the program offered in February 2012. I learned a lot in 3 days. Dan made the class very interesting, and I learned about the muscle groups by painting on real horses. Dan is a great teacher, and very patient with his students. 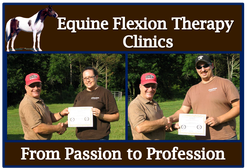 I am thankful for the opportunity provided by Dan and his Equine Flexion Therapy Certification. My plans are to compliment my business as a farrier by offering Equine Flexion Therapy to my customers. Dan Marcum gives a very comprehensive class on Equine Flexion Therapy that can enhance any farrier's knowledge. I have taken classed from Dan at the FNRC/Casey & Son Horseshoeing School and was happy with his classes. I have used this knowledge many times to help horses with muscles and joint problems with a lot of success. I have used Equine Flexion Therapy on Barrel racing horses before the event to try to warm up the horse like a track and field runner would warm up before a race. This therapy DOES WORK VERY WELL. It took three one thousands of second off the best time this horse and rider had ever had in the past. This rider is a world class rider, and was amazed by the results. I recommend for anyone to take Dan's classes. 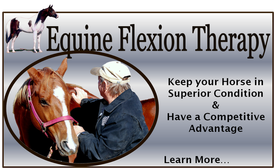 Farriers can benefit from Flexion Therapy because you as a farrier can earn additional income for your farrier business.